Convert Outlook Express DBX Files to PST, MSG, EML & file formats. 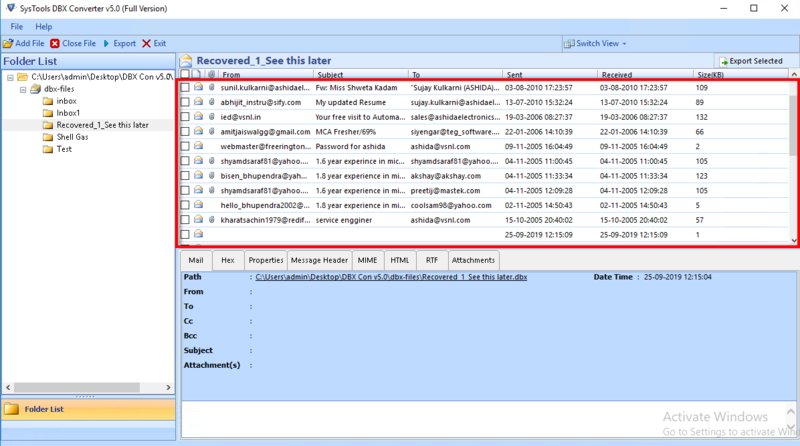 View DBX Emails along with attachments in different styles. Import DBX Files to PST in bulk without MS Outlook. Metadata & folder structure remains intact after DBX to PST Conversion. 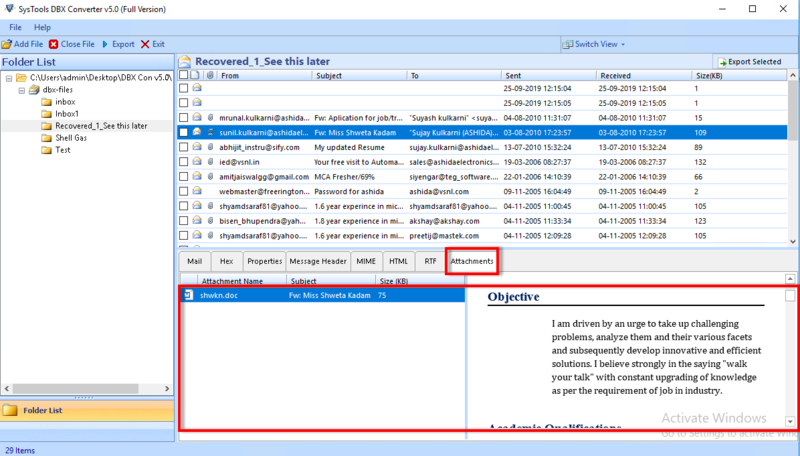 Auto Load emails from configured Outlook Express profile. Split Large PST file during Outlook Express to MS Outlook migration. Perform Outlook Express to Outlook conversion with the help of DBX to PST Converter tool. You can migrate multiple files(s) and folders(s) from Outlook Express profile to PST. The software allows you to create single PST file for each DBX file. The tool can also convert single emails from DBX files to MSG file format. All the emails can be accessed individually in many email platforms like Outlook. Thunderbird, Outlook Express, etc. During Outlook Express DBX to Outlook PST Conversion, you can use this option to split large resultant PST file. It will break that file into smaller PST files by the defined size. It can help you to manage the data in PST file. If you have a cluster of emails files and folders, and you want to convert selected files, then you can simply use this option. You can choose the specific file or folder to retain and discard the rest of the DBX files and folders. If you are converting DBX to MSG, then you can save all the emails with the specific naming convention. With the help of DBX to PST Converter tool, you can save emails by Date, Subject and many other naming options. The Outlook Express to Outlook Migration tool comprises of several unique features and it provides the ability to perform conversion of .dbx files to different file formats seamlessly. Convert DBX files to PST file format in batch. The tool can also export DBX to MSG & other file formats. 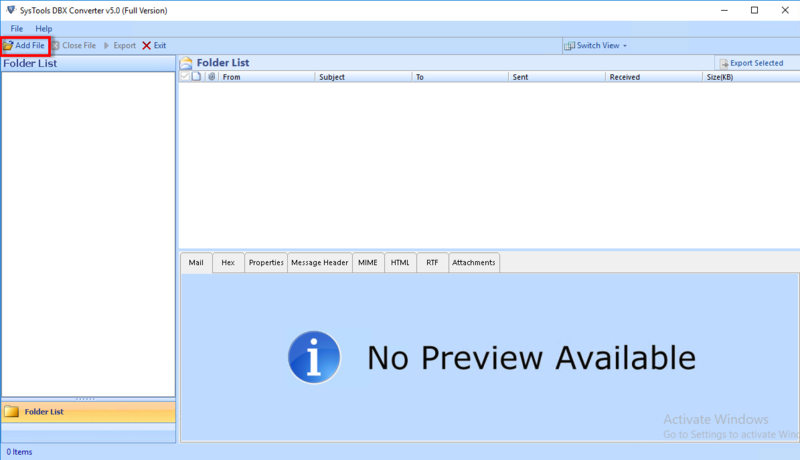 Split large Outlook PST file into smaller and manageable PST files. 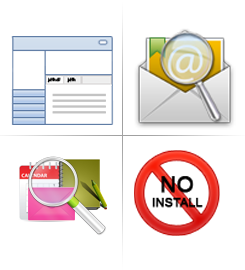 Automatically detects the Outlook Express DBX file from the system. 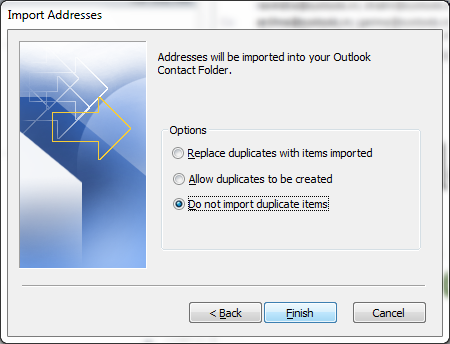 Selective file(s)/folder(s) migration from Outlook Express profile into a desirable file. Preview emails along with attachments in various styles. Save individual DBX emails in single messages using Naming Convention. No need to install MS Outlook for migration. The primary reason for the migration can be attributed to the fact that Microsoft has stopped the support for Windows XP and now every user who is still using this email application is suspected to new vulnerabilities in the form of viruses, malware and other attacks. Hence, each user needs to migrate from the Older OS to newer and efficient OS such as Windows 7 or 8. When you migrate your OS, then you will most likely migrate to a new email client. 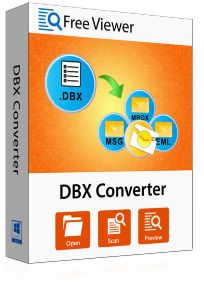 Therefore, you can migrate to many popular email applications with the help of DBX to PST Converter tool. Hence, it is necessary to migrate Outlook Express DBX to Outlook PST to transfer data from one email application to other easily. Apart from the illustrated features of OE to Outlook converter, this tool is enough capable to do other tasks. The tool is a cohesive and comprehensive solution for the conversion process. Create a new folder to save DBX files as PST, MSG & other files. Scan DBX file and view item count from each folder. Preview attachments from DBX Files like images, documents, etc. Keep the meta attributes and folder structure intact. 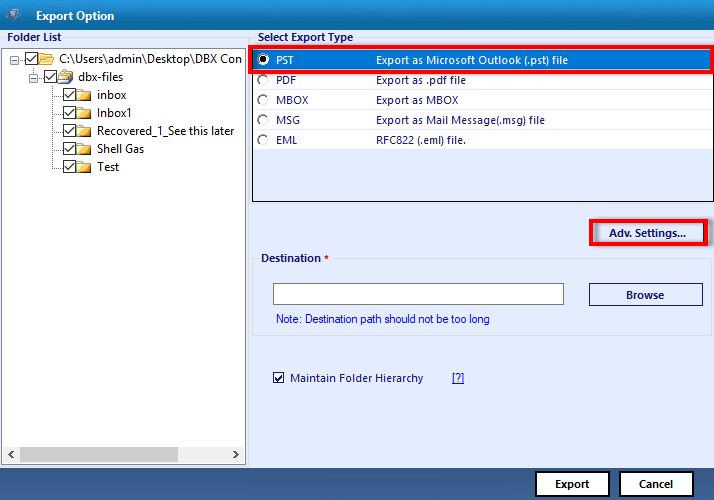 Export selective data from Outlook Express DBX file to Outlook. Click on Import Internet Mail and Addresses button. Once selected, click on Next button. After that, click on Next button to Proceed. 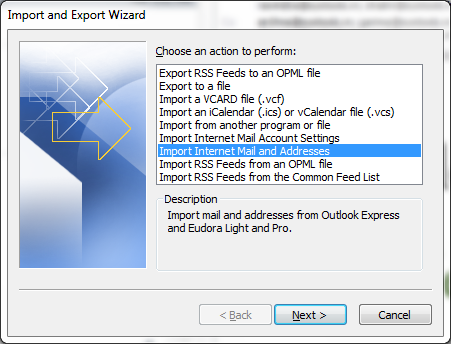 The next screen will prompt you to choose either Eudora or Outlook Express (Outlook Express 4.x, 5.x, 6.x). Choose Later and proceed ahead by clicking on Next button. The Outlook will also import Outlook Express contacts. Therefore, in the final step, it will ask how you wish to retain the duplicate contacts that can conflict with the existing one to be handled. Choose your preference and click on Finish button. Demo version of DBX to PST Converter shows the Preview & Export only 25 Items/Folder from DBX file to PST. For Windows 10/8.1/8/7 or Vista users, please launch the tool as "Run as Administrator. Is the application compatible with latest versions of Outlook? The Software converts the DBX files into PST format which is compatible with different version of the Outlook i.e Outlook 2007, 2010, 2013 and Outlook 2016. What can I do to transfer from Outlook Express to Window Live Mail Client? You can easily migrate from your existing Outlook Express account to Window Live Mail client (successor of Outlook Express) with the help of DBX to PST Converter tool. Once you select the emails to be converted, you only need to choose the file format. Then, after the conversion gets completed, you can then easily migrate those converted emails into different Windows Live Mail (Windows Mail in case of Vista). What are the platforms supportable by the software ? The software currently supports Windows 10, 8.1, 8, 7 & Vista and is compatible with MS Outlook 2016, 2013, 2010 & 2007 versions. "After the Microsoft discontinuation of XP, like others, I was also upgrading to Windows 7 but I simply cannot let my emails go as DBX file will no longer work in there. But DBX to Outlook migration software helped me in retaining all my emails in Outlook 2013 and I am happy with the seamless conversation process." "Clever and simple! Does not ask for much user input and do most of the stuff on its own. The DBX to PST Converter is recommended to all who wants to migrate from Outlook Express to the newer email client offering by Microsoft. The software also supports Windows OS 10, 8.1, 8, 7, Vista, XP, Server 2008, 2012 as well. " "With the help of Outlook Express to Outlook Converter tool, I have migrated all the emails from OE to Microsoft Outlook. The interface of the application is quite simple that I didn't get any trouble during the migration. The tool smoothly converts DBX files to PST file format. Thanks for such an amazing utility!" "The software works efficiently and converts Outlook Express DBX files to all the mentioned file formats in a very less time. I am impressed with the smooth functioning of the tool. I didn't get any issue in migrating data from Outlook Express to Microsoft Outlook. I must say that this tool is very effective!!" View repair and recovered DBX file.